A big, warm welcome! We’re grateful you’re here to read our thoughts about good food. 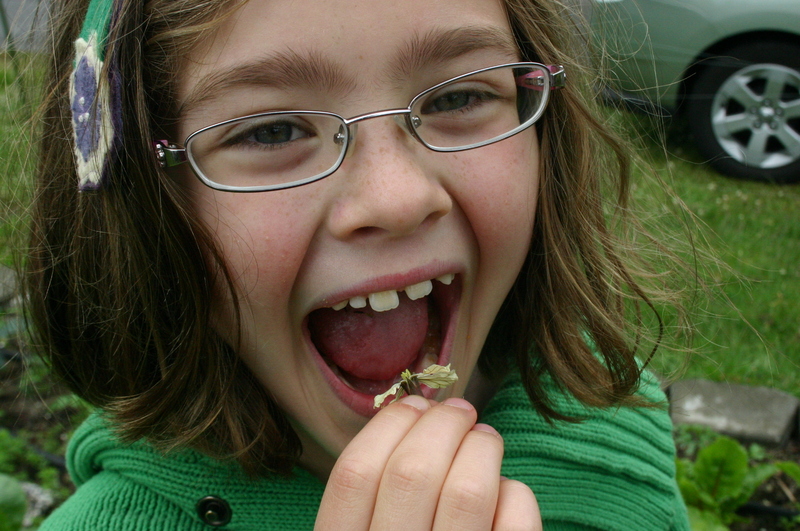 We love tasty, fair, local foods and imagine you do, too. Each and every summer I’m taken by surprise. I still expect June to be hot and dry, and summer break to be a simple and lazy affair. But it isn’t. Lady Summer is afoot with her tapping pen, bulging calendar and fickle rain patterns. Chie and I decided to dive right into the middle of this and launch a food blog. And to do this in style, we thought we’d get together, face to face, and cook. But last weekend we weren’t sure we’d be able to follow through. Our schedules just wouldn’t give. It is. It’s the kind of fullness that leaves you alternately wilting and thriving. 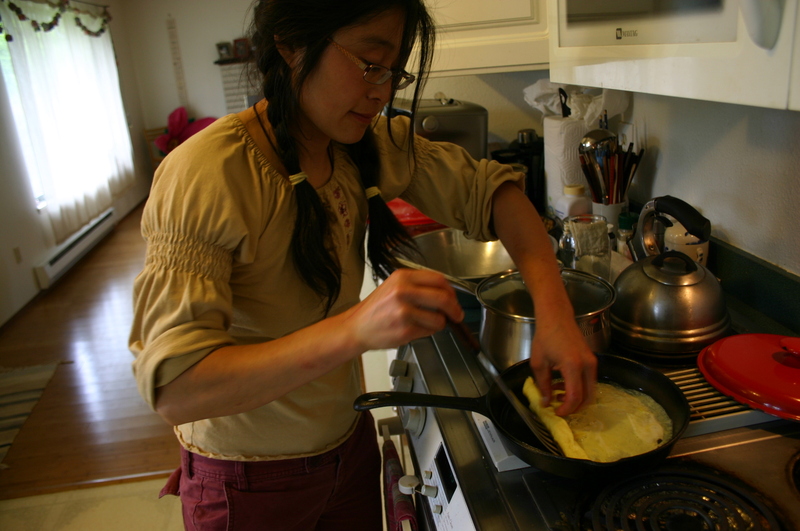 Five of us did end up gathering at Chie’s house – we shoehorned it into an afternoon – to talk, cook and snap photos. It rained earlier in the day and the garden, shepherded into gorgeous, overflowing bounty by Chie’s husband, was of the kind of saturated green that makes you want to make like a slug, sit on a giant leaf of cabbage all day and eat. 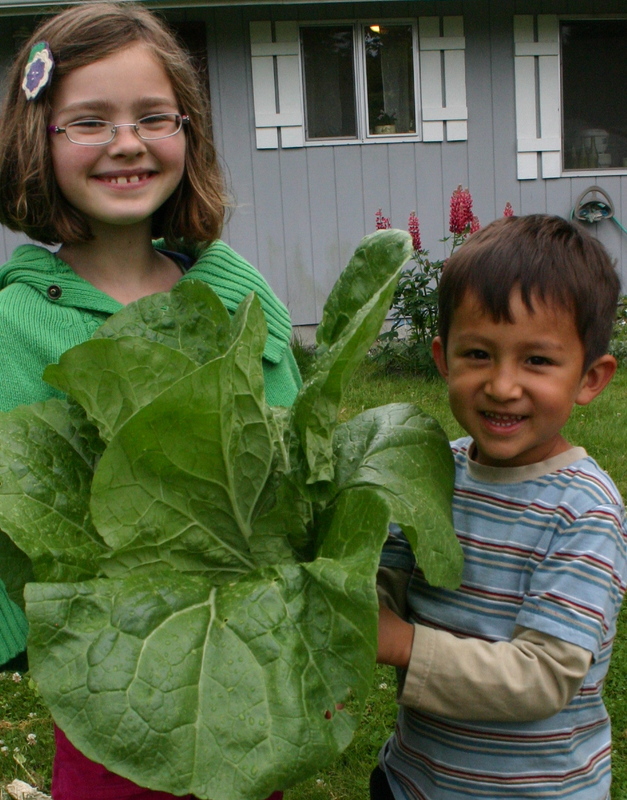 We did our share of nibbling on arugula flowers and an enormous mystery cabbage that Chie harvested before we went inside to get started. We knew we needed to make something fun (three out of the five in our party were under the age of eight) and something to use up a portion of the produce that’s springing out of the earth and our refrigerator drawers. Chie’s answer was nori rolls or makizushi. 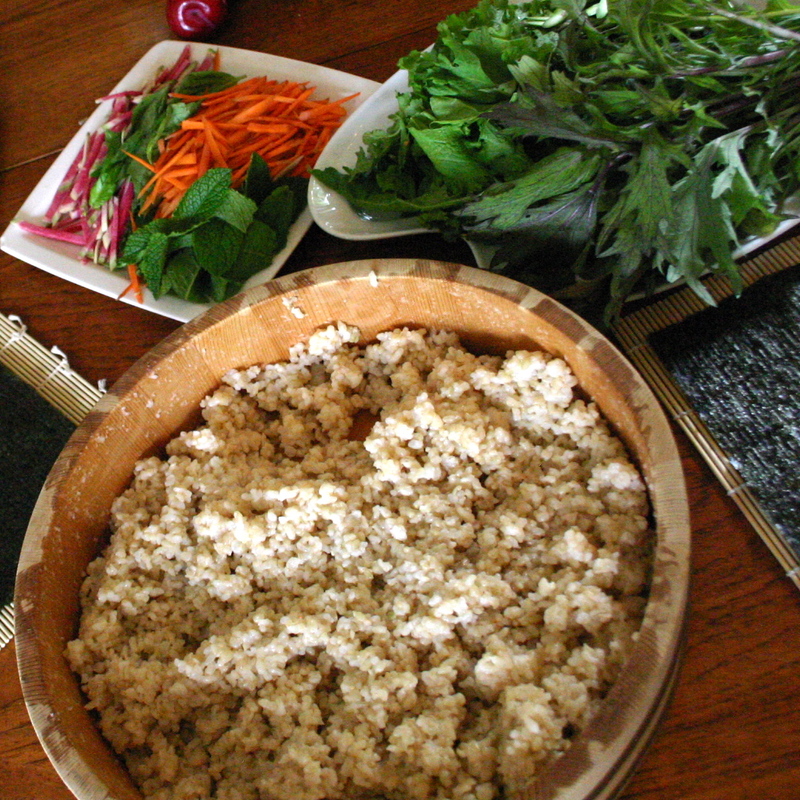 When we arrived, a cloth was already draped over a round wooden bowl filled with sushi rice. Though rice and nori aren’t local (the nori sheets we used were produced in Japan, the rice by a sustainable company out of California), together they form a perfect vehicle for enjoying whatever beautiful thing is waiting to be eaten. 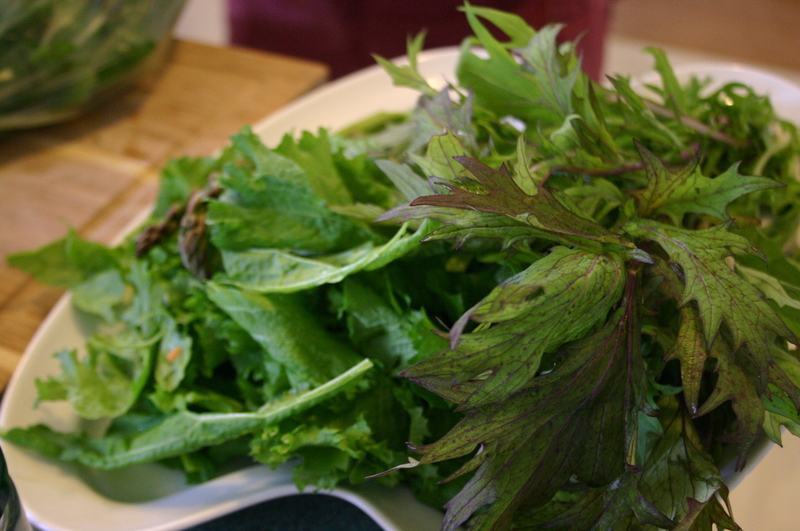 All the fillings we used were grown in Washington, a number of them from hyperlocal sources. But before we get to the produce, let’s take a look at how to make an egg cake. 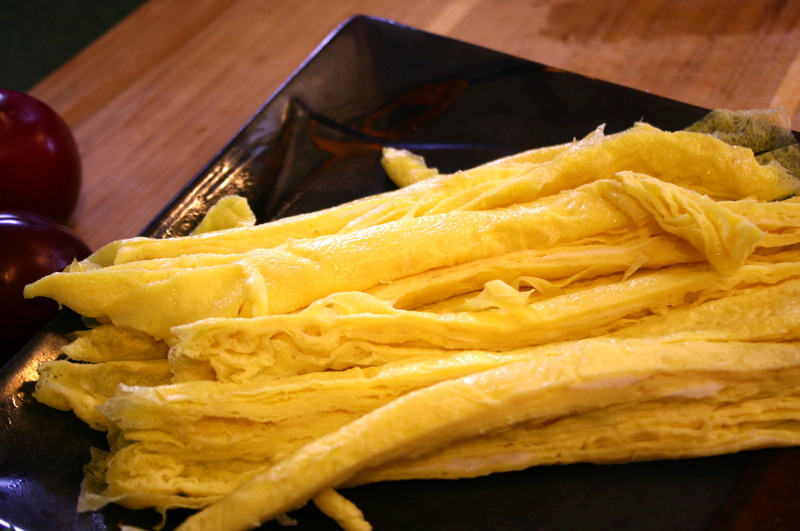 The goal is to make a very thin egg crepe and roll it. Scramble eggs with water or dashi (broth) in a bowl and pour into a very hot, greased pan (she used virgin coconut oil). Use a pan that can handle eggs, like a well-seasoned cast iron skillet. You’ll need to work quickly. Pour the egg into the pan and tilt to spread evenly. 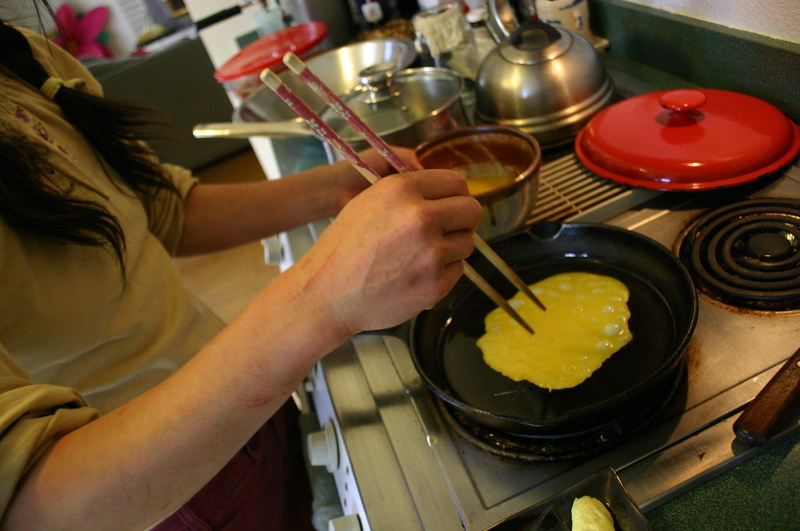 In a few seconds, when the egg is cooked but not browned, pry up the edge with a spatula, chopstick or fork and roll it snug. Leave the rolled egg in the pan, along the back edge, and pour another round of egg in the remainder of the pan. The second crepe will adhere to the first as it cooks. When this one is finished, take the first and roll it back over the second to make one large roll. 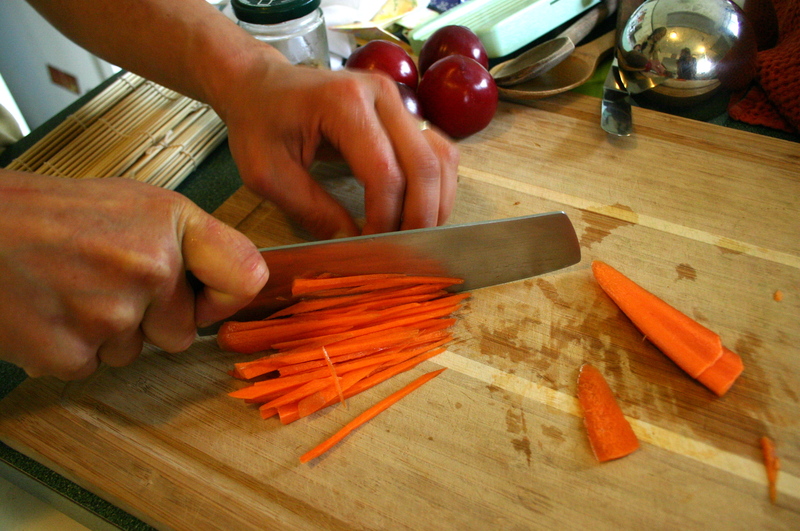 Remove, cool slightly and slice into long strips. The rice is waiting. The egg is rolled and sliced. 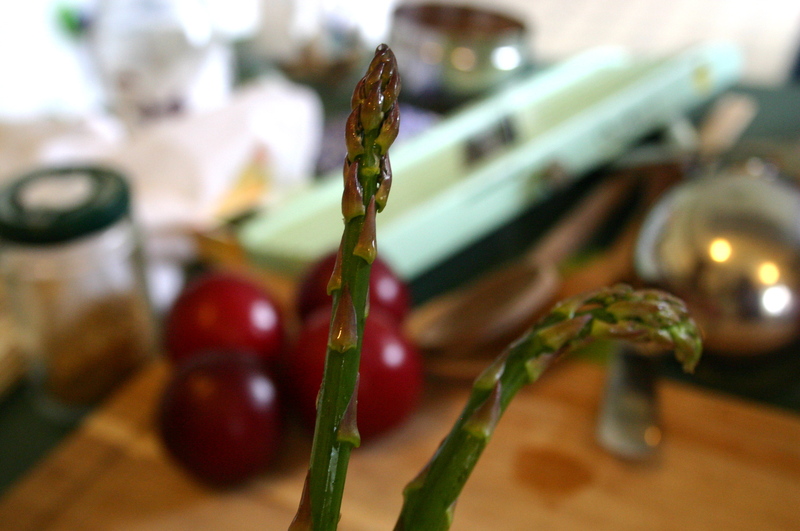 Now for color and texture: vegetables. What do you have around? 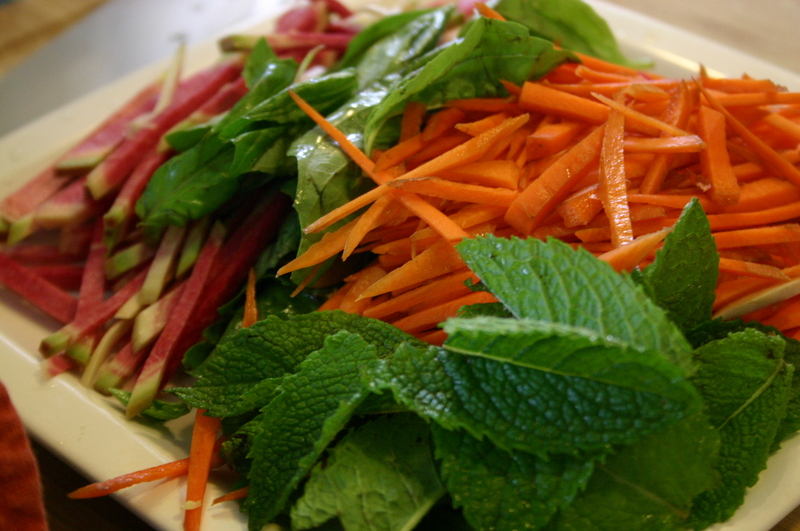 We had carrot, mint, radish, basil, asparagus and greens. Watermelon radish, basil and mint. 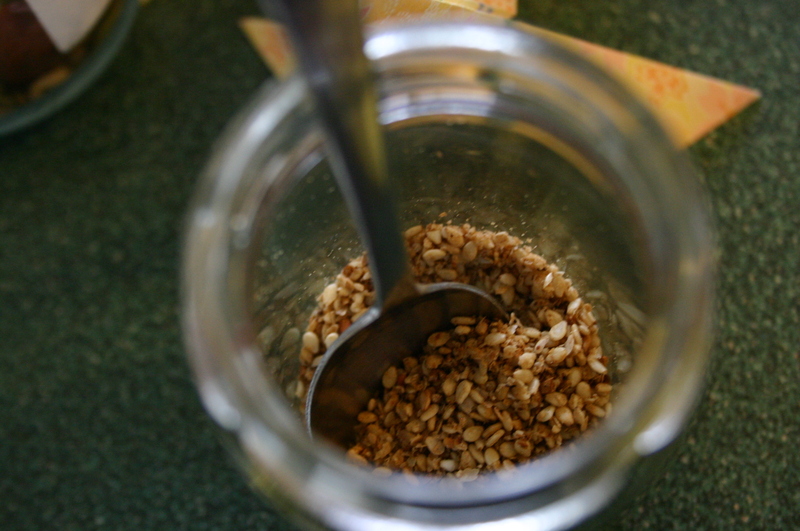 Toasted, crushed sesame seeds for texture. With all the food prepared, it’s time for a tutorial. Place the shiny side of a nori sheet face down and press the rice all the way to the edges, leaving a half-inch strip of nori at the top. Place strips of your fillings in a long heap, close to the bottom of the sheet. 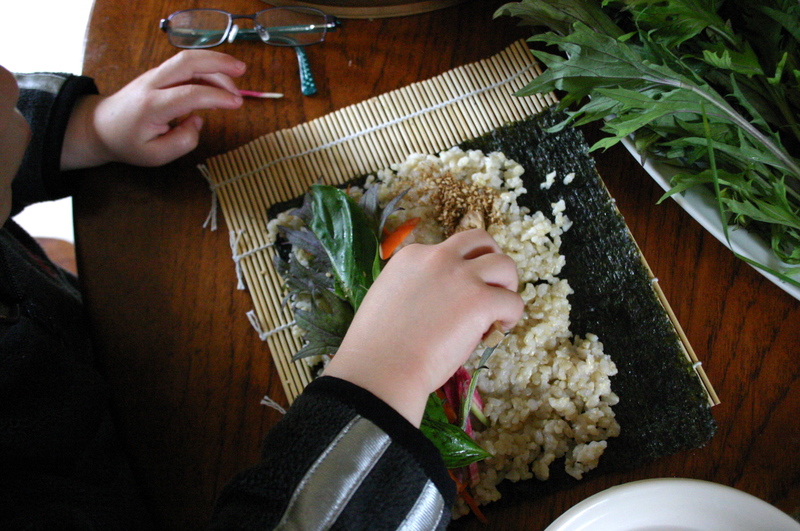 Then roll from the bottom, tucking the fillings in as you roll tightly, using a sushi mat or pressing all along the length of the roll with your hands as you go. The rolls should adhere on their own. If not, seal them closed with a finger dipped in water. Slice into discs, snack on the ends and display on a pretty dish for your hungry people. Use a bit of tamari, wasabi or ginger if you like, but not so much that it overwhelms the flavor. We thought they were delicious plain. Wash the sushi rice and drain. Let it sit for a while to let it absorb the water. In a large heavy bottomed pot, add the rice, water, and kombu. Bring to a boil. Skim the foam and turn the heat down to a simmer. Place the lid until cooked about 30 minutes. In the meantime, place the vinegar, salt, and honey in a small pot and bring to a simmer to melt together. Cool and set aside. Prepare a large bowl, hand fan, and rice spoon (shyamoji) or wooden spatula. I have a sushi bowl made of cedar that I use, but any large bowl, preferably with a flat bottom for even cooling, will do. When the rice is done, let it sit with the lid on to soak for about 5 minutes. It is a good idea not to let it sit too long at this point to avoid mushy, pasty rice. Dump out into the prepared bowl and start fanning with one hand and mixing it with the wooden spatula with the other. It is important to fan continuously and use slicing motions across the rice to avoid over mixing it into a mushy texture. You can have someone help you to fan to make it easier. 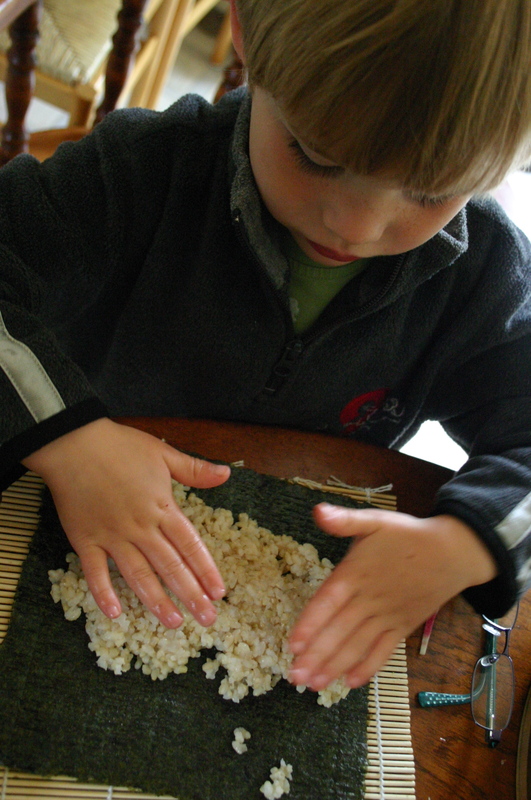 Once the rice is just warm to the touch, get the sushi mats ready. 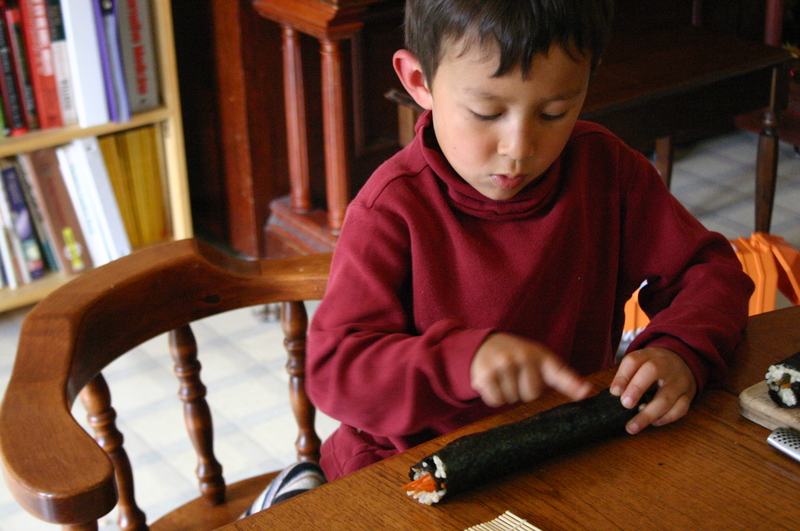 If you don’t have a sushi rolling mat, just use a clean, dry surface to roll it with your hands, using your fingers like tentacles. This entry was posted in Recipes, Summer Vegetables and tagged Asparagus, Basil, Carrot, Egg, Greens, Local, Mint, Nori, Organic, Radish, Rice. Bookmark the permalink. I can’t wait to try making this! Love to each of you! Great article! 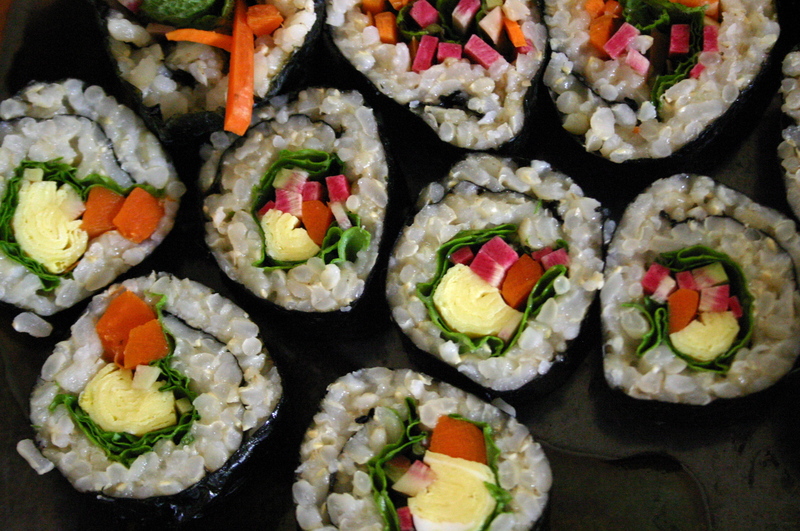 I can’t wait to make the nori rolls; tell Cyrus he makes a great “roll” model. The food photos are lovely! Congratulations on your debut! Hope yours turn out beautifully – thanks for visiting and all your support, Lynda! Awesome launch, delicious-looking food, darling kids and beautiful photos! I love your “fresh” ideas! Beautiful post!!!! Anxiously awaiting your next…. Wonderful site, it all looks yummy. Keep up the good work. & I’ll check back in next week. Looking forward to having you back next week, Rose! Me too, MJ – if you’re ever out this way I’ll take you on a food tour!